Aided by remarkable technological progression in the global automotive industry, U.S. off-road vehicle market has emerged as one of the most lucrative verticals in the recent years. 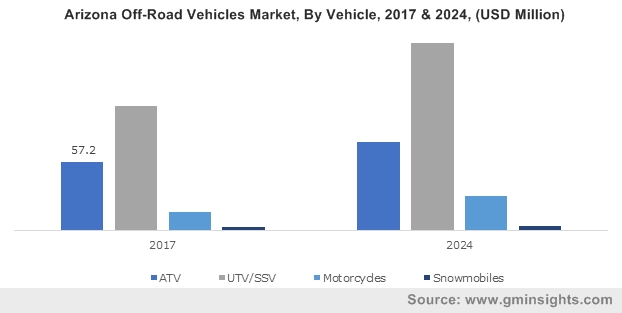 The massive surge in demand for SSV (Side by Side Vehicles), snowmobiles, off-road motorbikes, and ATV (All-Terrain Vehicles) for military, sports, or recreational activities in the region have been identified as the key drivers behind the robust growth. Besides the rising product demand, the geographical location of the nation also plays an important role in the proliferation of U.S. off-road vehicle market. Speaking along similar lines, according to NSIDC (National Snow & Ice Data Center), more than 46 million square kilometers of Earth's surface is covered under snow each year and the Northern Hemisphere accounts for about 98%. If reports are to be believed, the Rochester city in New York gets more snow than any other large cities in the USA, with an annual average of 255 cm. In fact, around 16 of the 51 larger cities in the United States receives annual snowfall of 60 cm or more. The region is therefore likely to witness tremendous demand for snowmobiles for adventure and recreational activities such as camping, hunting, and trailing as well as for goods transportation and distance travelling. The U.S. off-road vehicle market from snowmobiles vehicles is further expected to witness remarkable expansion trends with regional companies going the whole hog to cater to the consumer demand. An instance bearing testimony to the same is of the American manufacturer of snowmobiles, ATVs, and other sports vehicles, Polaris Industries. The company launched its new INDY EVO in January 2018 that could deliver a sporty and comfortable riding experience to fuel the riders’ passion for snowmobiling. Another recent instance is of the globally popular snowmobile manufacturer BRP (Bombardier Recreational Products). The company has recently brought together its much-admired Ski-Doo REV Gen4 platform into four-stroke models that is expected to give riders the ultimate snowmobiling experience with enhanced engine options. Under its Ski-Doo brand, the company has also introduced the Rotax 900 ACE Turbo engine, OXYGEN helmet, and expansion of the 600R E-TEC engine into more ORV models. The instances vividly demonstrate the unrelenting quest of the U.S. off-road vehicle industry players to improve rider experience with innovation and technologically advanced products. It is important to mention that besides snowmobile vehicles, off-road motorcycles are also witnessing lucrative growth avenues. Statistics throwing in light on the same is of OIO, that claims the overall off-roading expenditure of the U.S. outdoor participants to be over USD 50 million in 2017. Estimates claim that with industry players following similar product portfolio expansion trend, the U.S. off-road motorcycles market to register a y-o-y growth rate of 6% over 2018-2024. Where is the U.S. ORVs market heading over 2018-2024? According to a report by Global Market Insights, Inc., the U.S. off-road vehicle market is projected to exceed valuation of USD 13.5 billion by 2024, given the growing participation of the American population in adventure and recreational activities in the ensuing years. In addition, the regional government is also supporting the industry growth by forming partnerships with National Park Service, Bureau of Land Management, and U.S. Forest Service for outdoor activities. In terms of the geographical landscape, California and Texas are expected to emerge as profitable growth avenues for potential investors in the U.S. ORVs market. If reports are to be believed, California accounted for 10% share of the overall industry share in 2017. In the coming years, the U.S. off-road vehicle market expansion trends are expected to materialize along the current wave of electric vehicles in the global automotive industry. In fact, few companies have already embraced the shift towards sustainable design and have developed electric off-road vehicle with top speed ranging from 125 to 250 mph. It further remains to be seen how off-road vehicle manufacturers will take up with this new sustainability wave and launch cost-effective ORVs, given the change in consumer preferences and soaring environmental concerns.